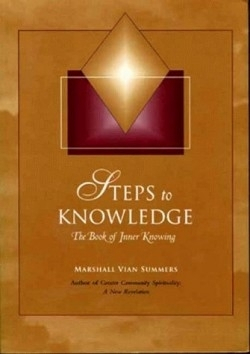 Steps to Knowledge along with New Knowledge Library’s three other books contend with such works as A Course in Miracles and Conversations with God Series as a complete self-study spiritual program. This book presents daily meditative practices that lead to an understanding “transcending human boundaries of perception, insight and comprehension.” This understanding is described as a Greater Community Way of Knowledge. Summers has pioneered in the field of inner guidance and spiritual direction since 1975 and is the only teacher of the Greater Community Spirituality. He is also the founder of The Society of The Greater Community Way of Knowledge, a religious non-profit organization whose mission is to present and teach these steps that lead one to find their purpose and mission in life. This work urges regular daily practice of study, consideration and contemplation. It is a well-thought out program to bring a person’s life into balance through knowledge. Because of the emphasis on knowledge, the reader who approaches life through thought, mind, knowing and logic will be the one most served by this practical approach to personal and ultimately community spirituality. Noticeably absent is a focus on love. Nicely organized and handsomely designed, it also holds a sense of urgency for living an inspired life.